Pūpū A ʻO ʻEwa wins Wo Learning Champion Community Builder Award! The reviewers were impressed by the way Pūpū A ʻO ʻEwa truly embraces community building, involving current and former students as well as faculty and community members. Students are contributors but also serve as volunteers to maintain the digital space. Through this online access to expressions of Hawaiian culture, the community is enriched and the contributors are celebrated. On behalf of our talented artists and writers as well as our dedicated volunteers, Pūpū A ʻOʻEwa is honored to receive this award. 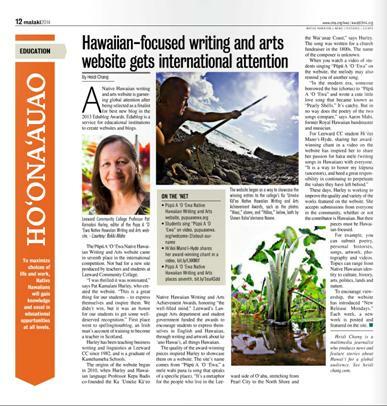 The Native Hawaiian Writing and Arts website Pūpū A ʻO ʻEwa (pupuaoewa.org) enjoyed a very busy Spring semester. They were nominated as an Edublog Best New Blog of the Year and news articles in UH News, MidWeek, and Ka Wai Ola ʻO OHA helped bring widespread recognition to our campus and our students. Ulukau, The Hawaiian Electronic Library (ulukau.org) invited Pūpū to be included as a resource, which means a wider audience for the original Native Hawaiian-focused artistic works that Pūpū publishes. Twelve artists and writers, most of them current and former Leeward CC students, were featured in New Release Mondays last Spring. Finally, Pūpū , together with Student Life, awarded $600 in cash and prizes in their Ka ʻUmeke Kāʻeo Achievement Awards to up-and-coming student artists and writers. Everyone at Pūpū A ʻO ʻEwa thanks the many faculty and staff members for their support and look forward to serving our community this Fall. Student Hiʻilei Manoʻi-Hyde is interviewed (great job!) and two of Shawn Kahoʻolemana Naoneʻs photos are featured (fantastic!) Rokki Midro, our wonderful volunteer videographer, has a photo credit (sheʻs a miracle worker for making me look better!) Mahalo to Kathleen Cabral for your generosity and aloha. Weʻre so proud of all the students and writers and artists who make Pūpū A ʻO ʻEwa a special creative space for ke ano Hawaiʻi! Much aloha to you all! Congratulations, Auliʻi Silva! Mahalo a nui for being such a strong advocate for our Native Hawaiian students! Pearl City, Hawaii, is best known for its rich Hawaiian history and natural resources. It has also gained recognition as a growing academic center through the efforts of Leeward Community College. Leeward proudly serves the Wai’anae region, home to one of the world’s largest Native Hawaiian population. At Leeward, 27% of the student body is Native Hawaiian, 21.5% Filipino, 8% Japanese, 3% Pacific Islander, 2% Chinese, and since its establishment in 1968, the Native Hawaiian student population has steadily grown to over 2,100 students. Leeward’s mission is to help students attain their goals through “high-quality liberal arts and career and technical education”, and encourage students to become responsible citizens. Leeward advances the educational goals of all students with a special commitment to Native Hawaiians. This mission is exemplified by the Ke Ala ‘lke (The Road to Knowledge) program, where student participants research their genealogy, interview Native Hawaiian elders, and perform land stewardship services. Ke Ala ʻIke scholars are granted the privilege of wearing kīhei (shawl or cloak,) that embodies the meaningful people, experiences, and knowledge acquired through their journey at commencement. Additionally, the program offers scholars information about scholarships, financial aid, academic advising, and internships. In the past 2 years, Ke Ala ‘Ike has enrolled 250 students of all majors and ethnicities. Students who participated in the program graduated at much higher rates compared to the entire student population, and a majority of its graduates have enrolled at baccalaureate campuses and graduate programs. S.T.E.M. Success—this program aims to foster Native Hawaiians’ interest in science, technological, engineering, and math career fields. The program also helps to nurture all Leeward students’ passion for place-based sciences. Learn more. (Pūpū A ʻO ʻEwa) Native Hawaiian Arts & Writing Online Literary Magazine—this program helps to encourage Native Hawaiian excellence in writing. It provides a creative space for writers and artists to nurture creativity, self-expression and innovation. Learn more. Leeward’s programs have made lasting impacts in students’ lives. Take Mike Chang. He struggled with poverty, the loss of his wife and children, and over 25 years of drug addiction before enrolling at Leeward at the age of 45. When Mike started out at Leeward, he didn’t know how to use a computer, struggled with writing, and started with introductory math classes. Ke Ala ‘Ike provided the necessary support structure so that, despite these hurdles, Mike was able to gain an education and embark on a career path. Mike completed the Ke Ala ʻIke program, moved onto a four-year institution, and is now a junior with a strong academic record.